Not really, but I'm pretending to be one on my blog. You know how on one day you can pop into TJ Maxx and nothing strikes your fancy? Not. at. all. Then, since you are a true Fashionista Wannabe, you can go back to TJ Maxx on another day and strike a shopping cart gold mine? Somehow a cute blue and white Talbots casual skirt that just oozed summer popped into my cart along with a pair of Seven for All Mankind jeans. Granted, the Seven jeans may be knock-offs made in a garage down Mexico way, but they look *real* and fit nicely, so I'm pleading ignorance to how a usually priced $100+ pair of jeans can sell for $24.99. I also fell head over heels for all the embellished shirts and ruffle-y drape-y vests Well, I'm not sure if they are vests, but they are so going over my T-shirts this spring and summer anyway. See? As if TJ Maxx wasn't enough, Old Navy has lots of cuteness on special now too. Annelise begged me to take her picture with all of the freaky plastic people, so I did, and so why on earth does it look like it's absolutely killing her to stand there next to the chipped plastic dog? Hummph! They have a ton of cute skirts that will be perfect for summer on special right now for $15, so run, don't walk to your nearest store to pick up one or three like I did, m'kay? 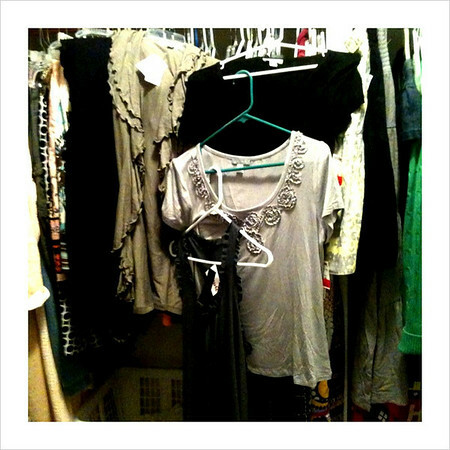 It might be hard to tell, but I tried to hang most of my shirts by color. On the right side are the greens and blues and on the left is still kind of a hodge podge of dresses, skirts, and miscellaneous blouses/tops. 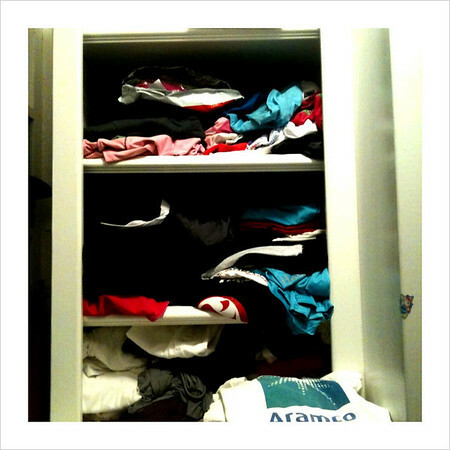 Over here are more shirts grouped in their happy color families and on the lower shelf are more skirts. I realize now I have gone a tad skirt nutso. And that's where the somewhat organized part stops. Here are the shelves where all of my running shirts/tanks, shorts/skirts, layering tanks and miscellaneous t-shirts are neatly stacked crammed within an inch of their lives. If that didn't send you crying for your mama, well, then take a peek at my shoe shelves. I used to have my shoes in labeled plastic shoeboxes, but now I have this. 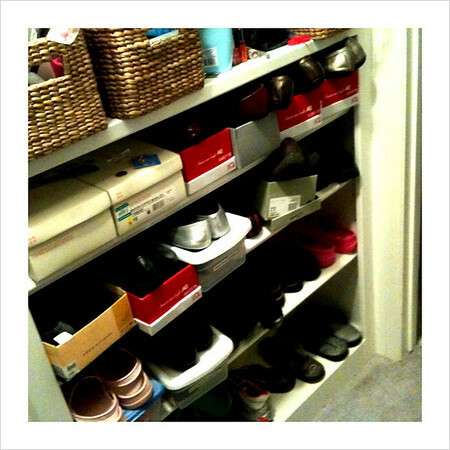 Truth be told, those labeled shoe boxes are upstairs filled with shoes I haven't worn in three years. I really need to purge them and reuse the boxes for this rat's nest, don't I? Something else you might not see is the fine layer of powder (both baby powder and Coco Mademoiselle dusting powder) coating most surfaces and/or exposed shoes, but believe me, it's there. Since I get dressed in the closet and do my powdering up in there, this is a never ending battle. I'm keeping my eye out (okay, both eyes) for inexpensive baskets to better contain some of the clothes and miscellany currently stacked willy nilly on the shelves. I'd also like to invest in better clothes hangers (we have a major hodge podge of cheap plastic and even some "I Said No Wire Hangers, Christina!! 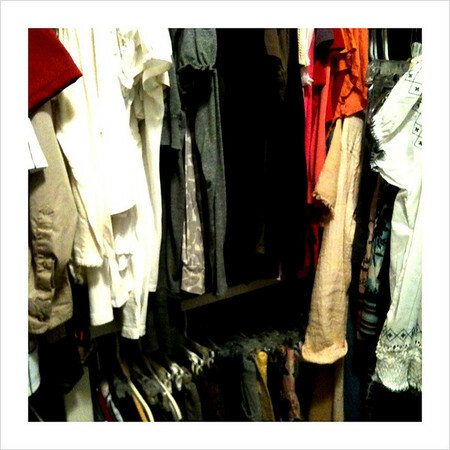 "), but I always talk myself out of spending $$ on hangers. So I can go back to TJ Maxx and Old Navy, of course. I have been sick all week and it seems like A LIFETIME.... having TJ withdrawls... ha! And I have not been into Old Navy in forever but keep seeing the commercials with the swing skirts. Thinking I must have at least one. Can you believe Scott didn't get my wire hangers reference?!??! Please tell me y'all got it!! You look cute in everything girl! Oh, I forgot, I wore one of the ruffle-y, drape-y vest last night, and liked it, but kept singing the theme song to Maude in my head. 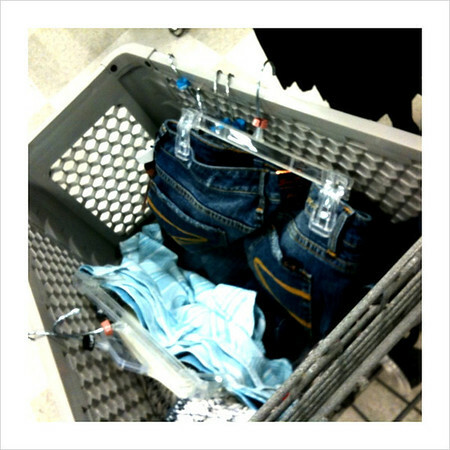 I think I need clothes shopping lessons, I have no skills whatsoever. When I go to T.J. Maxx I only ever browse the stationery aisle and houseware section. 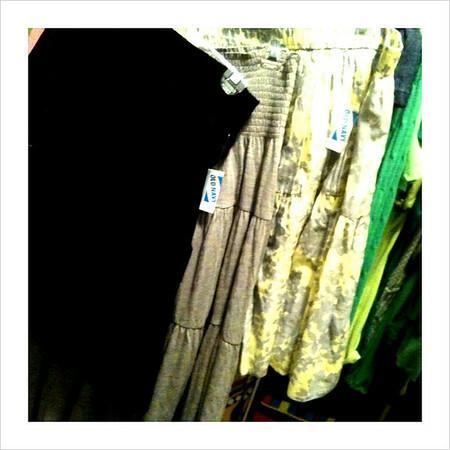 I bought 4 skirts at Old Navy! Plus I have several from last summer. I have practically abandoned shorts, except for specific situations. I rarely take the time to shop at TJ Maxx. Since I usually have a kid or two or three with me, it is just not fun to sift through the racks trying to find a treasure. 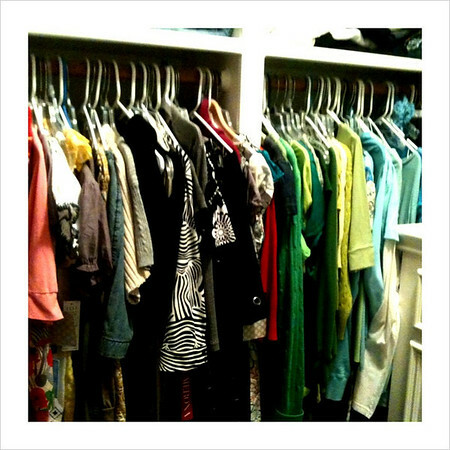 Jill: Sometimes I skip the clothes aisles all together too and head for the home decor/kitchen/stationery section. Nicole: Hooray for you!! I enjoy skirts much more than shorts in the summer too. 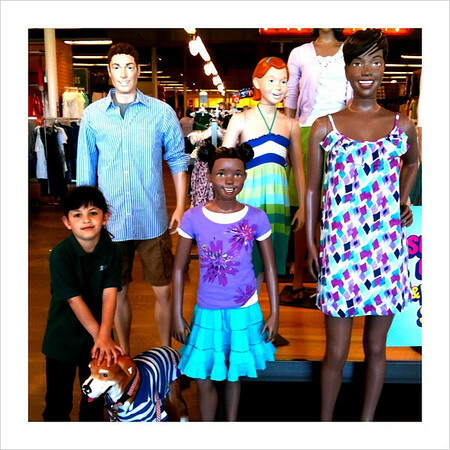 You are right, navigating through TJ Maxx with numerous kidlets in tow would drive one crazy!